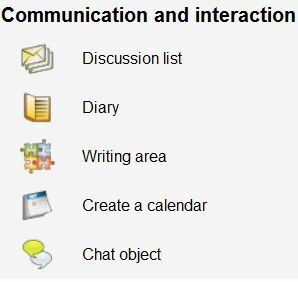 The most commonly used interaction tools in Optima are the discussion list, the chat object and the diary. The contribution of each discussion participant can also be assessed (a grade and written feedback). Contributors can add their comments when it suits them. The chat object is the forum for simultaneous communication. Each user can have a personal diary or a group may also keep a joint diary. The users’ ability to access and comment on the contents of each others’ diaries depends on the settings. The group-specific diary is the joint diary of all workspace members that can be used for such purposes as introducing oneself. Optima has a number of tools for producing, returning and following different types of assignments and exercises. The return box is a handy tool for returning essay-type assignments. The teacher can determine whether the returned assignments can only be viewed by the teacher or whether the students are able to view each others’ assignments and produce peer reviews on them. The teacher can grade the assignments and give feedback on them directly through the return box. The students can view the feedback in their own return boxes. 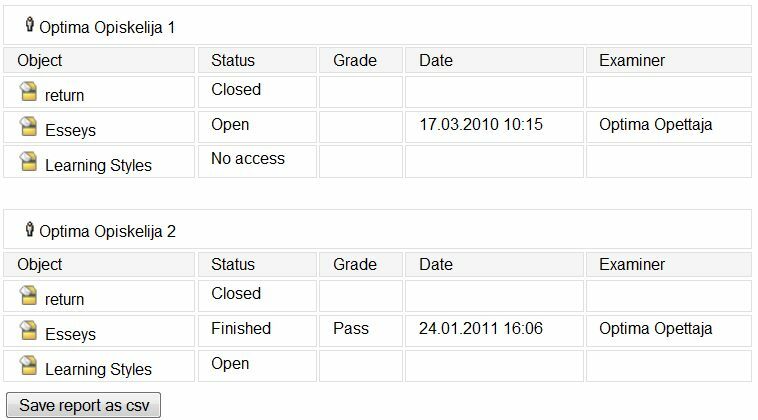 The teacher can see in real time which of the students have returned their assignments and whose assignments have already been assessed. You can also create an ordinary folder for returning assignments and allow the students to read its contents and write in it or create a return folder for each student. The form is an extremely versatile tool for making different types of questionnaires and assignments and for collecting feedback. It can be used for making multiple choice exercises and open questionnaires. You can add links and images to it, which means that an assignment can be equipped with such links as online videos. Both multiple choice exercises and multiple choice drills or exams also provide tools for creating different types of questionnaires and assignments. 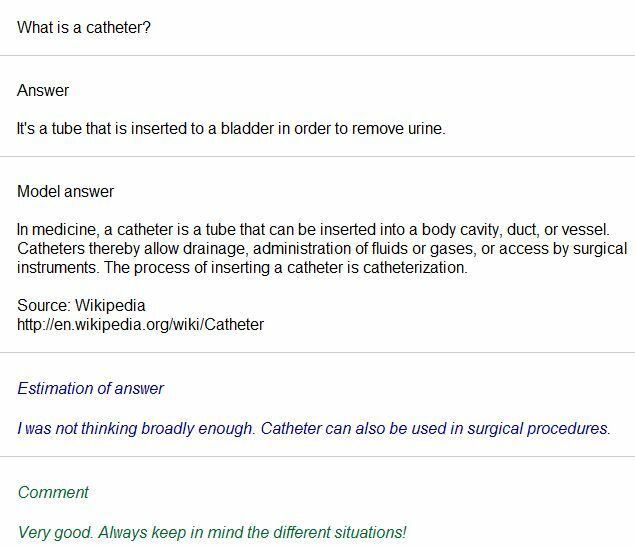 Using a model answer quiz, you can create assignments with one or more questions where the student can view the model answer after answering the question. After giving the answers, the students should reflect (comment) on and assess their answers. The teacher can also add comments to the assessment and the student’s answer. The model answer quiz can be used for both short exercises and essay-type assignments in such tasks as scenario exercises (How would you act in situation X? ), translation assignments or in concept definition. The students are not able to view each others’ answers. 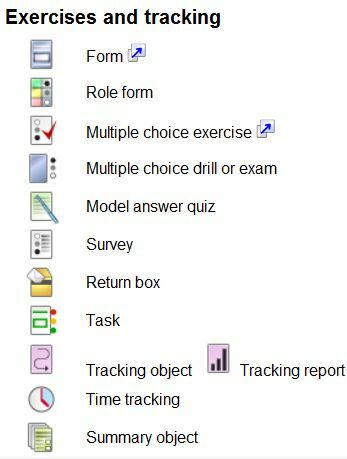 The summary object is a tool summing up the results from the return box, the discussion list and the multiple choice drill or exam. The tool facilitates the work of both teachers and students as they can see the overall situation in one glance. The teacher’s detailed report view is shown below.